"It's hard to bake an onion ring as good as a deep-fried version. These are pretty good, so check it out! 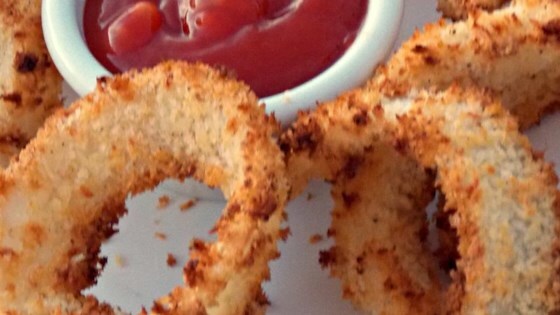 This makes a very crunchy, easy, no-muss, no-fuss onion ring." Whisk egg whites with milk in a bowl until thoroughly combined; season egg mixture with a pinch of cayenne pepper. Place panko crumbs into a separate bowl. Place onion rings into a large resealable plastic bag. Add flour, salt, and black pepper; seal bag and shake until rings are well coated with flour. Drop flour-coated onion rings into egg white-milk mixture, a few at a time, and toss lightly with tongs until coated. Place rings into panko crumbs and gently shake the bowl to toss the crumbs with the onion rings until rings are coated with crumbs. Bake in the preheated oven until onion rings are tender and crumbs are lightly golden brown, 12 to 15 minutes. See how to make crispy onion rings in the oven. My 16 year old son made these tonight. They were really delicious!!! We had a few different sauces to dip them in. Will be making these again....so easy to make. It is really hard to duplicate deep fried onion rings. These were quite good. The difficult thing was trying to get the flour and then the panko bread crumbs to stick. I will try them again. Flavor was good. But the pano did not stick. Not so sure it's worth the mess. Followed a previous persons recommendation and put the onions in water prior to the breading. Worked much better.